When individuals begin the process of selling an unwanted diamond engagement ring, many are unsure where to turn. A few options typically come to mind, however: a jeweler, pawn shop or gold exchange, Craigslist or eBay, or an online diamond buying company. Here, we’ll look at the latter option. There are many online companies that specialize in buying fine diamond jewelry. The greatest advantage here is that you are working with a company who is educated and knowledgeable about buying fine jewelry, allowing them to make a more aggressive offer. At MJ Gabel, for example, our staff are all GIA (Gemological Institute of America) trained, and go through an apprentice-like program before beginning to work with the public. 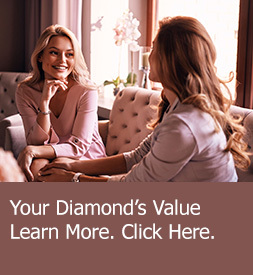 What also sets MJ Gabel apart from other diamond buyers is that we try to keep your jewelry in its current state, rather than working with just the materials. This allows us to offer a highly competitive price for your unwanted diamond jewelry. The reason selling jewelry online is not utilized more commonly is that most individuals do not live within commuting distance to such companies. In order to work with such a company, you need to ship your items for valuation. That can be a scary thought for many people. What if the ring becomes lost or stolen? At MJ Gabel, if you are not within driving distance to Webster, New York (a suburb of Rochester) we happily facilitate the mailing process for you to ensure everything is properly insured during transit. We serve clients around the world so whether you are close to our retail location or in New York City, Miami, Chicago, Dallas, or Los Angeles we are here for you. Another potentially scary thought of working with an online diamond buying company is figuring out which companies are authentic and ethical. We advise our clients to do their due diligence! Read as much as you can about a company prior to sending them your items, and read reviews carefully. Many companies will pay advertising agencies to leave fake, online reviews to increase their star count. Look for companies that have reviews with the Better Business Bureau to ensure their authenticity. Selling diamond jewelry can seem overwhelming to many because of the number of options available. Here at MJ Gabel, we are happy to discuss all your options with you and help navigate the selling process for you. We will always take the time to answer your questions or concerns about selling and help to guide you in the direction that fits best for you. When it comes to selling unwanted fine diamond jewelry, the only person who knows what option will work best for you is you!